Horace Engdahl was born in Karlskrona 1948. During the 1970s he became one of the founding members of the cultural magazine Kris whose influence on the intellectual and literary climate in Sweden hardly can be overestimated. In 1987 he received a PhD for his work Den romantiska texten : en essä i nio avsnitt (”The Romantic Text : an Essay in nine Chapters”) which to a large extent is a re-examination and reconsideration of the Swedish literary romanticism. By that time he had already established himself as a leading critic within the fields of literature and dance. Between the years 1989 and 1998 he was employed by the newspaper Dagens Nyheter and at the end of the same period also worked as a literary expert for Swedish Television. He was one of the founders of a writing series called Kykeon in which he helped introduce and translate previously unheeded texts of among others Maurice Blanchot. To his other achievements as a translator belongs german plays by Gotthold Ephraim Lessing, Heinrich von Kleist and Arthur Schnitzler. 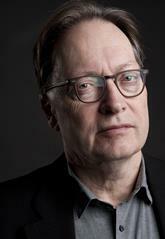 In the year 1997 Horace Engdahl was elected to the Swedish Academy as successor to the writer Johannes Edfelt and during the years 1999 to 2009 he took on the role as permanent secretary. Concurrently he was a board member of the Swedish Royal Opera and adjunct professor at Århus University. The end of the world would be a fully bearable thought if only it was possible to have a cigarette afterwards.